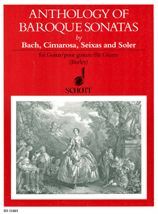 The term ´Sonata´has been used since the 17th Century to describe an instrumental chamber composition asn opposed to ´Cantata´implying a work for voices. By the late 18th Century Sonata had become restricted almost entirely to works for one or two instruments - usually harpsichord or, e.g. violin or flute together with harpsichord continuo. The pieces featured in this anthology were composed entirely for solo instruments - the single movement sonatas by Soler, Cimarosa, and Seixas, were originally for harpsichord and the four-movement Bach Sonata was for the violin. All the works in the current collection have been adapted to a greater or lesser degree; adjustments include transposing the piece to a more accommodating key, raising some bass notes by an octave and - in the harpsichord pieces - the thinning out of some harmonies. After careful consideration I have decided to add a minimal amount of supporting bass notes to the Bach Sonata and lower some of the existing bass notes by an octave.